Check the read Hardware of intelligent circuits up to 20 tags per second. 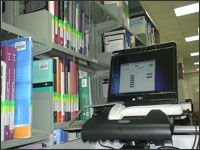 Check books and materials in the library (Inventory Collection) quickly and effectively to monitor statistics (Inventory Collection) books to 250,000 copies in just 3.5 hours. Book Search (Search items) that you want. The book will be placed behind the statistics are from the book 100 to 10,000 copies of the book is just 8 minutes. The Book Shelf (Shelf order) signal with the results, they found a book on the floor (Locating mis-shelved volumes). Weeding out materials for screening books to bring out in each case as quickly and efficiently. You can search for books, books that have been restored. Before returning to class. Antenna is designed to give a signal frequency of 13.56 MHz tags as quickly as possible. There are connections for data transfer to the library automatically. Data transfer between the device and the loan system - all through the automated charging. The device can transfer data wirelessly (Wireless). The battery lasts up to 4 hours before being charged again. There are signs on the machine. When I read the tag. When the battery power is low. To users. Designed to be convenient to use (Ergonomic design) to prevent fatigue of the wrist and allows for longer use. Will be closed by the time set for energy efficiency (Auto Turn Off) will be recorded automatically before shutting down.